A friend asked on a forum if anyone wanted to play Gregor Hutton’s Remember Tomorrow – Near Future Role-Playing as Play by Post. I said ‘Yes!’ and ordered the game. Below follows my impressions from reading it. 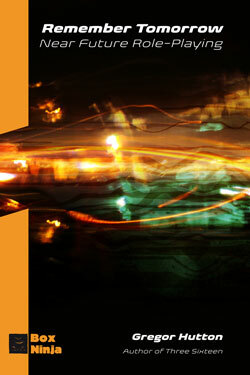 The book has the usual indie format, 6×9, soft cover and weighs in at 48 pages. John Hodgson has made a nice cover and the interior is full of grainy photo manipulations. Even for 48 pages it is a fast read, many of the pages have full page illustrations and some pages are filled with tables and lists. The setting is the near future cyber-punk from Neuromancer and Bladerunner. The game gives enough information that someone unfamiliar with the source material could get the general idea. The rules are light and fast and work at the conflict/scene resolution level. The players roll 3d10, and assign the dice once rolled to the three stats Able, Ready and Willing. Every die lower than or equal to the stat gives one success, most successes wins. Every PC has a goal that he or she is working towards. Once the PC is Able, Ready and Willing the goal is reached. Most of the game exists in the form, which is a variant of rotating GM. There is a pool of PCs and Factions. Each player holds one PC as their own, remaining PCs are NPCs for the time being. But under certain conditions a player may switch the held PC for any available in the pool. The factions are the opponents of the PCs, and both new PCs and Factions can be introduced even after the game has started. There is a strict division of the game into scenes, and the players take turns acting as the Controller (GM) who sets scenes to challenge the PCs of the other players. The setting is ok, it would have been nice to get more information, but there is enough to go on. The rules are good, they only reflect the PCs and Factions struggles. But that is the focus of the game, and they do it well. The form is excellent, there are clear instructions and an example showing how the game should be played. Yes, obviously. We have just completed character generation and are currently building the Factions that will oppose the PCs. But, will I play it at a table, will it go in my con bag? Maybe, I’m not sure. There is a while lot of overlap between Remember Tomorrow and my own game While the World Ends. They solve similar problems in similar ways. It seems that WtWE has a more predictable game length and the simpler rule set of the two. On the other hand actual play will start quicker with Remember Tomorrow as no time is spent on doing the lengthy collaborative prep work of WtWE. 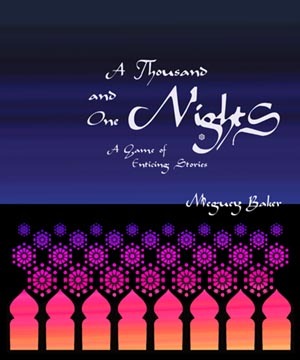 A Thousand and One Nights – A Game of Enticing Stories by Meguey Baker is a long time favorite indie/story game of mine. We have been playing it for years and I have demoed it on cons, or rather; We have been playing the playtest version for years… I got the playtest game from Meguey’s blog and have been playing it since. I was ordering other games from Leisure Games, saw 1001 Nights and ordered one just to compare the retail version with the playtest version we have been playing. The book itself is a small, almost square booklet of 48 pages. The layout is very odd, there is lots of space, and the game is a quick read. There are a few old full page illustrations by H.J. Ford showing scenes from the tales. The setting is the fairy tales in A Thousand and One Nights, familiar to everyone. The book assumes familiarity and just adds some details like name customs and descriptions of clothing for the period. Play takes place at two levels. The players play courtiers at the court of the Sultan, caught behind the palace walls. These courtiers scheme against each other and plot their escape. But they also tell stories, which makes a game within the game. The rules are simple, and mostly concern the story within the story-level of play, and are focused on the collection of dice. Yes, in 1001 Nights the players collect dice, any dice can be used, as long as they have an even number of faces. After every story told in the game the player assigns them to three pools, 1. Keeping well with the Sultan, 2. Planning escape and 3. Scheming against other courtiers, and then rolls them to see the effects the story had on the courtiers. Since there are two levels of play, there are two different forms in the game, and both are clearly described. When playing the courtiers in the Sultan’s palace the game is GM-less free narration, coupled with events dictated by the end game of each told story, depicting the scheming of the courtiers. At the story level the game is more traditional, the story teller acts like a traditional GM, and the players are the players, playing the roles of the main characters in the story. Actions are resolved by the GM assigning the different outcomes of an action to ranges of result of a die, and rolling to see what happens. The players ask questions, acting as the courtiers, and all questions answered in the story give them one die. The setting is weak as presented in the game, but since everyone knows the setting already it is not a problem for actual play. The rules are good, there are enough of them to support the courtier level of play, without getting in the way in the story level. And they are clearly explained. The form is good, there are clear instructions on how to play the game, and there is an extended example of play in the last chapter of the book showing the nuances. Well, I already did, sort of. I have played the playtest version lots. Most up to this point in this review is valid for both the playtest and retail versions of the game (the playtest version lacks illustrations and the example of play). However the retail version addresses some issues we have had with pacing in the game, and is just a little bit more streamlined in other aspects, so I think we’ll switch to the retail version of the game from now on. www.nightskygames.com – Official 1001 Nights page.